On today’s tray are some of my Chaos Marine Warband’s Chosen, from the Dark Vengeance box set. There’s also twelve of the twenty four Dark Angel Marines I’ve been working on. They just need their bases finished and they’ll be done. 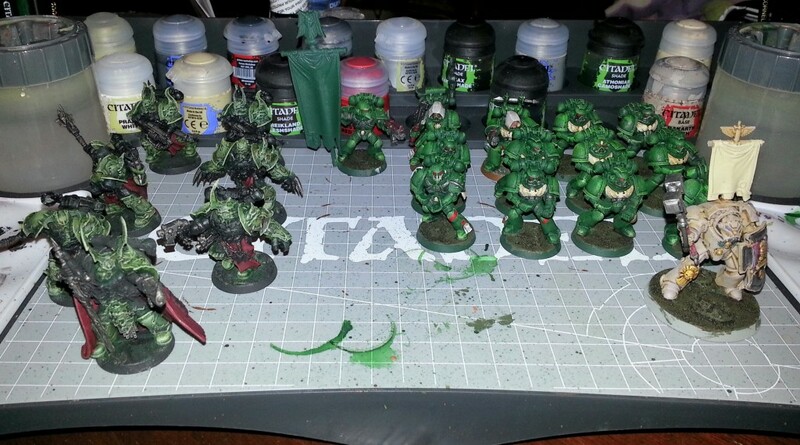 I also started basing my Deathwing Terminator banner carrier. I was going to do something fancy, but it wasn’t going to happen anytime soon, so I just did something simple. Hopefully I can get it all done by tomorrow and move onto something a bit bigger.